Haven’t we all suspected that our technology could be conspiring against us? Are you one of the people who believes Facebook is reading your texts? Or listening to your calls? Could your computer be watching you right now? Perhaps theoretically benign technology is not only invading your privacy, but on the verge of taking over your life. And not in a friendly manner. This episode of The X-Files addresses similar conspiracy theories in a clever, funny way, largely discarding dialogue and completely eliminating the cast surrounding Fox Mulder and Dana Scully until the final scene. It’s a neat stand-alone episode written by Shannon Hamblin and Kristen Cloke, and it pairs well with veteran Glen Morgan’s tight, effective direction. “Rm9sbG93ZXJz” opens with the story of “Tay.” If you were wondering, this is a true story: A chatbot was introduced on Twitter by Microsoft in 2016, with the idea that it would learn from interactions with humans and then adapt accordingly. But after only 16 hours, it was spewing racist, hateful language, learning from what it saw on the internet. It was shut down. If we’re going to have AI that learns from our online behavior, shouldn’t we be concerned about so much of our online behavior? This is the introduction to a dinner date between Mulder and Scully at an empty Japanese restaurant called Forowa. The entire restaurant is deserted, and Mulder and Scully order their food on screens. They just swipe and push, hearing a robotic voice say “Yum.” Scully reads a headline about Elon Musk’s belief in the danger of AI and they wait for their food to arrive. Scully’s looks great; Mulder’s looks like a slimy fish. He goes into the kitchen to complain and finds out that robots are preparing the food as well. There are no humans to hear his complaints. Mulder goes to pay with his credit card and the machine holds it when he refuses to tip. He bangs on the counter and the place goes haywire. They pry open a door to leave, but Forowa still has Mulder’s card. And their technological nightmare is just beginning. Scully leaves in an Uber rip-off called Whipz, which also happens to be driverless. After an entirely wordless opening, we finally get some dialogue, but it’s between Scully and her talkative machine, which then starts going way too fast. She tells it to slow down, but repeatedly gets nowhere. It finally gets her home, and she stumbles out of the car, deeply dissatisfied with the experience. Mulder’s ride home isn’t much better. He tries to get his car to play Prince’s “Controversy” but it blasts CSNY’s “Teach Your Children” instead — the song will return again and again this episode, telegraphing that we need to teach our technology how to behave or risk its AI revolution. On his way home, Mulder is encouraged to tip Forowa again. He refuses. From there, Morgan intercuts truly bad tech nightmares for both of our heroes that jump back and forth. At Mulder’s house, he first tries to call his bank (named Bigly) to cancel his credit card, but gets stuck on hold. He goes to watch The Six Million Dollar Man and suddenly sees footage of himself being recorded live from outside. It’s a drone! While dealing with Bigly Bank, the drones keep returning. He takes out the first one with a baseball bat, but it calls reinforcements, including one that picks up the wounded soldier. Before long, Mulder’s computer is asking him what he wants to believe in, while dozens of mini-drones appear outside of his house like fireflies. He flees, and on his way to Scully, he gets a message about tipping Forowa again. Could this stop the madness? Scully’s AI agony is even worse. First, she runs out of “Rock It Like a Redhead” styling cream and gets a notification asking her if she wants to buy more. Creepy. Then she gets a drone delivery on her front step from a company called RoboEx. It’s a Zuemz — a riff on the Roomba. She fires it up and follows it around as it vacuums her house, pushing a “personal massager” from under her bed, immediately getting a notification about new colors for others she could order. She tries to text Mulder and it fails, just as her Zuemz starts getting a little aggressive. Scully packs up her robot and ends up on hold while trying to return it. As the volume rises on “Teach Your Children” in Scully’s house, the Zuemz escapes its box and makes a mess. She grabs it again and takes it outside to find the driverless Whipz waiting for her, getting another notification to like something. And then, as she leaves, it looks like the Zuemz is transmitting info about Scully’s house to the Whipz, echoing the real controversy about Roomba mapping your house. That’s when Scully’s house really goes haywire. There’s coffee everywhere and the returns website tells her that the answer to her privacy question is wrong when she knows it’s not — who hasn’t that happened to? — and then her fridge starts shooting ice cubes at her. She can’t open the doors. The gas fireplace goes off and starts leaking. And then her Zuemz actually tries to kill her, sparking an explosion as she busts the glass door of her house into Mulder’s arms. Mulder and Scully try to flee to a neighbor’s place, but the mini-drones chase them into a nearby warehouse. Before they get there, Mulder gets one of those “Sorry, I had to adjust my headset” robocalls that have taken years off our collective lives and Scully gets an ominous note that she will never make it to her office. 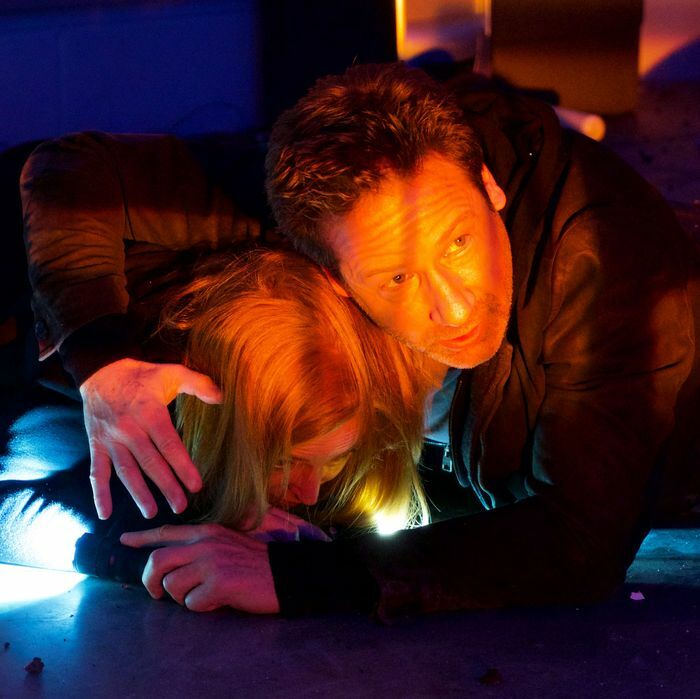 They get rid of their phones — and personal massager — but a drone rescues Mulder’s phone from the trash. The episode ends at an ordinary diner, as Mulder and Scully drop their phones and take each other’s hands. It will make you want to do the same with whomever happens to be near you. • You have to love the different styles of Mulder and Scully’s houses, even before he questions why hers is so much nicer. • If you like this kind of tech-conspiracy thing, don’t miss the truly great podcast Reply All, especially this episode that looks into if Facebook might be listening to you. • This episode could have been a disaster if not for Glen Morgan’s excellent direction. He keeps it moving, even if the climax feels rushed, much like a lot of the other installments this year. • Of course, nothing is accidental on The X-Files. The name of the restaurant that causes this tech nightmare is Forowa, which means “follower” in Japanese. It’s all about the followers.